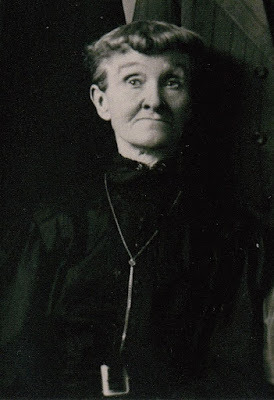 Who were Susan Elizabeth (Day) Stevens' parents? Beats me! I've been toiling away trying to confirm the identities of my third great-grandmother's parents for years. The first clues I found about the beginnings of her life actually came from its end. 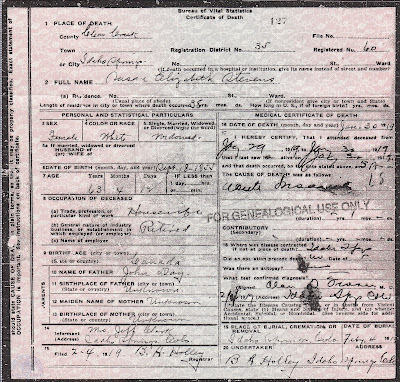 The informant on her 1919 death certificate - Susan's daughter Margaret - wrote that Susan's father was named John Day. Margaret didn't know the identity of her mother and wrote, "Unknown." If she couldn't remember the name of Susan's mother, how certain can I be that Margaret had the correct father's name? Margaret did know that her mother was born in Canada on September 18, 1855. Or at least she thought she knew the right birth date. In spring 2017, I visited Susan's grave in Idaho Springs, Colorado and saw that her headstone's inscription stated she was 74 years old when she died. Flipping the envelope over and quickly crunching the numbers (subtracting 74 years at death from her 1919 death year), I landed on an approximate birth year of 1845. That's ten years earlier than the 1855 birth year provided on the death certificate. Exactly how old was Susan? Fortunately, Susan appeared on three US Federal Census enumerations. What, if any clarity, could Uncle Sam provide? 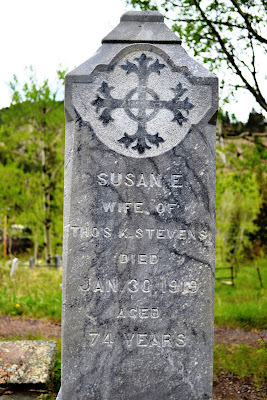 In 1880, Susan and her husband Thomas Stevens lived with his brother Richard Stevens in Idaho Springs, Clear Creek County, Colorado. She was 37 years old, putting her birth in about 1843. The census specified that Susan was born in Nova Scotia. It also indicated that both of her parents were born there, too. 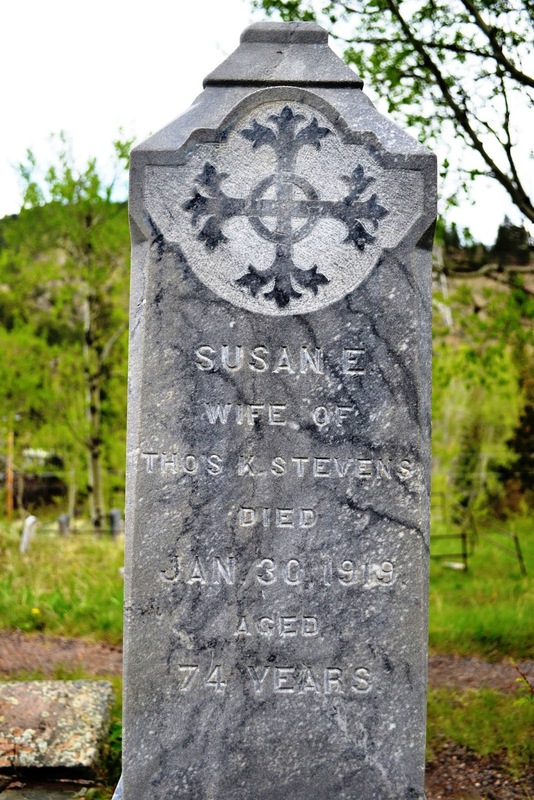 In 1900, Susan was a widow - having lost her husband Thomas and her eldest son Thomas Jr. to a grisly mining explosion. Still living in Idaho Springs, the census provided Susan's exact birth month and year: September 1843. 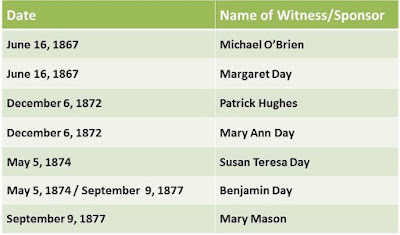 According to this census, Susan had had nine children but only four were still alive. She and her parents were all born in "Canada - England," but she immigrated to the United States in 1877. Taking a more casual approach in her elder years, Susan was enumerated as Susie Stephens. She started playing loose with her age, too, indicating she was 60 years old (back to that 1850 birth year). Canada-English was again listed as the birth location for herself and her parents. Investigating her birth location identified in the 1880 census, I found Susan and her husband Thomas Stevens in a Halifax. They appeared on the September 1866 civil birth registration for their first child Thomas Stevens, Jr.
Thomas Jr. was born September 18, 1866 in Popes Harbour, Halifax, Nova Scotia. The birth registration also records the marriage date and location for Susan and Thomas Sr. Get this - they were married on the summer solstice, June 21, 1866 in Halifax. A woman named Margaret Day served as a witness to the birth registration of the child. What relationship was she to Susan? Was she her mother? Sister? It's worth noting here that Susan went on to name one of her daughters Margaret (the same one who served as the informant on her death certificate). I found Thomas and Susan Stevens enumerated in the 1871 Canadian census in Popes Harbour with two young children, Thomas Jr. and a daughter Ann. 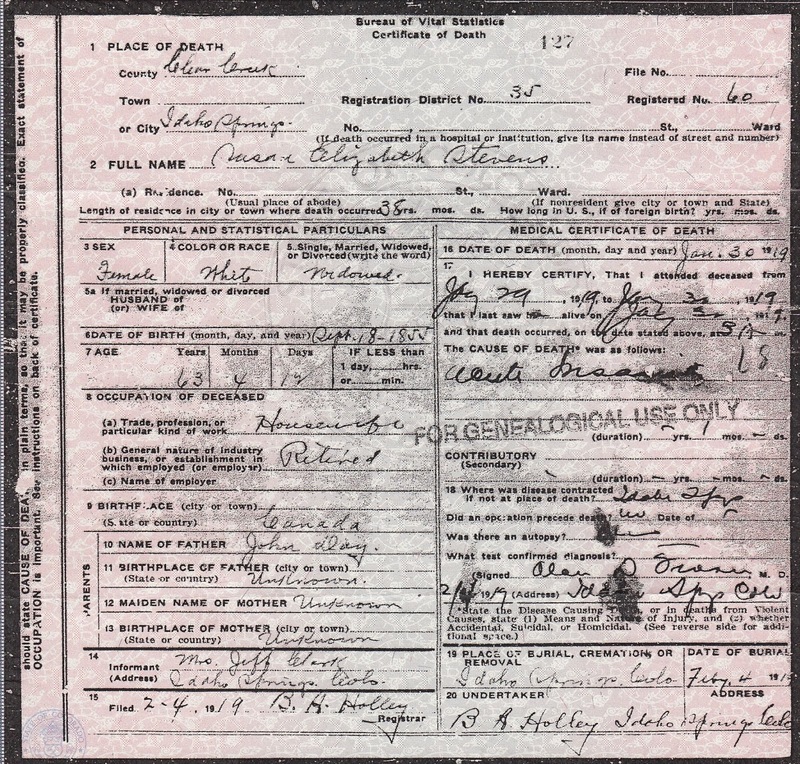 Susan was 27 years old putting her birth year at approximately 1843, again matching the 1900 US Census enumeration. She was born in Nova Scotia and recorded - along with her husband - as being a Catholic. I soon realized how important Susan's faith would be to make headway with my research of Nova Scotia records. "This detail is crucial as the government did not require civil registration of births, marriages and deaths prior to 1864. Furthermore, there are no civil registrations for births and deaths between 1877 and 1908. Because of this, church registers of baptisms, marriages and burials are extremely important research resources." Bottom line: you need to know your ancestor's religious affiliation in order to know which religious denomination's records to explore. Great! I knew Susan's faith and that I should be looking for her marriage and even her own baptism in Catholic church records. There was one problem. I didn't know her parish church. Since there is no searchable name index for the church records, I had to examine registers one by one. After trawling through dozens of digitized Halifax-area Catholic church registers, I finally located Thomas and Susan's family church where they baptized four of their children: St. Peter's Catholic Church in Sheet Harbour. He was baptized on June 16, 1867. His sponsors were Michael O'Brien and Margaret Day. I assume this was the same Margaret Day who appeared on the civil birth registration. She was baptized on December 6, 1872. Her sponsors were Patrick Hughes and Mary Ann Day. What relation was Mary Ann to Susan? Sadly, it appears that little Ann Stephens who was enumerated in the 1871 census was no longer living. No baptism record for her could be found and she is not among the family's children that make the move to Colorado. Margaret (yes, Susan's death certificate informant) was baptized on May 5, 1874. Her sponsors were Benjamin Day and Susan Teresa Day. More Susan's family, I presume. William was born in Tangier, Halifax and was baptized on September 9, 1877. His sponsors were Benjamin Day and Mary Mason. Sadly, little William passed away before the family moved to Colorado. Susan and Thomas would reuse the name William for their son William John Stevens who was born in 1879 when the family moved to Newfoundland (that baptism record has yet to be found). William John Stevens was my second great-grandfather. That's the sum total of the records I've been able to locate for Susan Elizabeth (Day) Stevens in Nova Scotia. From her death certificate, I have the name of her father, maybe (depending on how much we trust the informant's memory). I also have names for a handful of folks who shared Susan's maiden name and served as sponsors and witnesses at the baptism of her children. 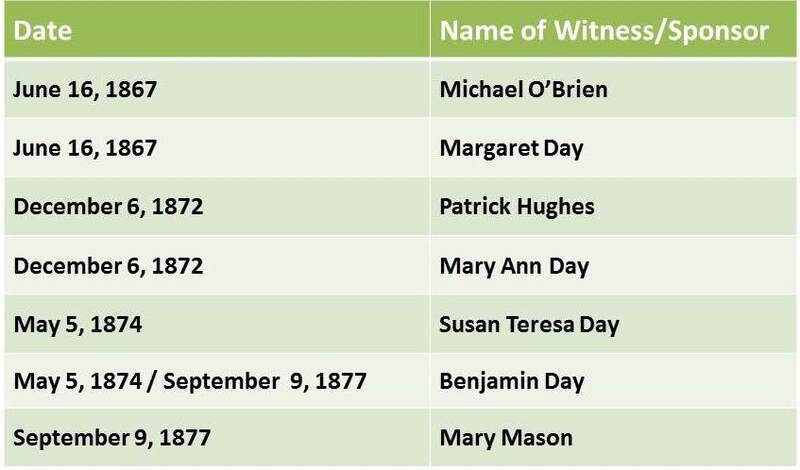 Could the baptism witnesses (outlined below) provide clues to other records that identify Susan's parents? Do I already have the names for her mother and siblings below? A marriage record between Susan and Thomas - if one could be found - would likely include her parents' names. Unfortunately, their marriage was not listed in St. Peter's registers. Where else in Halifax would it have occurred and been recorded? Of course, it would be fantastic if I could also find a baptism record for Susan. I'm not sure that church records were consistently kept in 1843, but I remain hopeful. Any Nova Scotia experts out there who have advice on where next to look for record of Susan's June 21, 1866 marriage to Thomas Stevens or her 1840'ish baptism? I'm all ears! Appreciate your sleuthing! I love the hunt for sure!! I'm seeking my 2gpa James William Fraser born NS 1820, parents born in Scotland and 2gma Isabella McMillan also born in NS 1826, parents also born in NS but I don't know the names of their parents or siblings!! They came to Wisconsin in mid-1840s then onward to Iowa where they are buried. All their kids appear to have been born in the US. I'd LOVE to find a record of either of their births or their marriage!! Or any type of migration for them. I keep plugging away though. Eventually I'll get a breakthrough! If you know their religious affiliation, I strongly encourage you to check surviving church registers in Nova Scotia for James William Fraser's baptism. Many of these records are digitized on FamilySearch. It's how I finally located a marriage record between Susan and Thomas, which just provided me with Susan's parents' names! I had a look at the FamilySearch catalog and for Halifax it looks like they are missing 1866-1870 Catholic marriages. [Can you tell I'm procrastinating?] I love a puzzle. I hope you find an expert for Nova Scotia to help you out here, Michael. Normand, thank you for sharing this information. Google the Canada 1871 census online. The images are digitized and free. There is one Margaret married to Thomas Day in Halifax in 1871, Roman Catholic. The other Margarets are either children or a Ch of England member. There is only one Benjamin Day, 24, living at home with Robert 49, Mary, 51, M.Ann 21, then Benj is listed, followed by Robert 19, Ellen 16 and Elizabeth 6. I wouldn't put much stock in John being Susan's father. I think a lot of people said when asked what a name was give the answer, "Uh, I think it was John." The Catholic family lived in Popes Harbour. Linda, thank you so much for your help! Shortly after I published this blog, a member of a Nova Scotia Genealogy Facebook group pointed me to St. Mary's Basilica in Halifax. After trawling through hundreds of records, I found Susan's marriage with her parents' names. She married on a different date than she gave on her son's birth record, and about a year and a half after his birth! And you're right, John was not her father's name. Although it may still be a family name. Looking forward to blogging how this brick wall finally tumbled down. Stay tuned. Great work, Michael! I can't believe how much you DID find. Keep on digging!! Thank you, Amy! I thoroughly enjoyed working with the church records. They're fantastic. I kept finding myself wishing they were as robust in the United States for the same time period.